Taxon of the Week this week may overstep its bounds a little. This is because of a somewhat surprising amount of disagreement about what exactly the taxon in question covers, despite being familiar to people the world around. Prepare to meet the Ardeinae, the herons. Herons belong to the family Ardeidae, which also includes the bitterns. When I was young and reading Ausich (1961), the division of this family was simple - the bitterns formed the subfamily Botaurinae, while everything else fell into Ardeinae. Since then, however, the picture has become a bit more complicated. 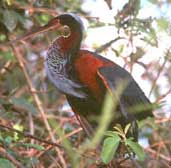 The bitterns are almost certainly nested within this broad picture of Ardeinae, and most authors have tended to restrict Ardeinae to birds more closely related to the genus Ardea than to the bitterns. Unfortunately, because different authors have found differing positions for the bitterns within heron phylogeny (McCracken & Sheldon, 1998), this has resulted in differing contents for Ardeinae. One point that most authors have agreed on is that the family Ardeidae can be divided into four main groups, whatever their inter-relationships might be. 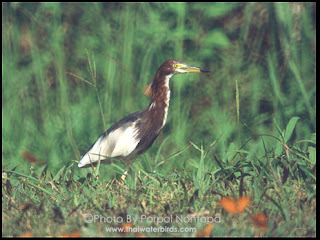 These groups are the day-herons (Ardea and its relatives), night-herons, bitterns and tiger-herons. There are also two single-species genera of more uncertain relationships, Cochlearius and Agamia. The South American tiger-herons have been regarded in the past as closely related to the day-herons on the basis of osteological data (Payne & Risley, 1976), but DNA-DNA hybridisation and vocal data position them as the basalmost group in the Ardeidae (McCracken & Sheldon, 1998). Unfortunately, heron phylogeny does not appear to have been given much attention since the DNA-DNA hybridisation days, and the only study I found referred to that used (barely) more advanced molecular methods (Chang et al., 2003) seems to have not included tiger-herons. Payne & Risley (1976) took a conservative approach that referred to each of the four groups as separate subfamilies, while Kushlan & Hancock (2005) included both the night-herons and day-herons in the Ardeinae and placed the other two groups in separate subfamilies. Kushlan & Hancock (2005) also recognised a separate subfamily each for Cochlearius and Agamia, but I suspect this more reflects their uncertain relationships rather than any positive idea about their positions. The day-herons (Ardeinae proper or tribe Ardeini, depending on whom you ask - Kushlan & Hancock, 2005, divide them into two tribes Ardeini and Egrettini, but that isn't an approach I've seen elsewhere) are the best-known of the groups, and include what most people associate with the name "heron" - long-necked, long-legged, stately birds. 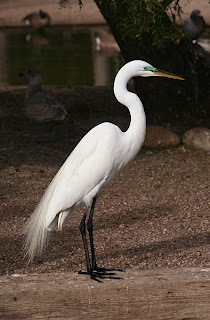 The image at the top of this post (from Wikimedia) shows a fairly typical example, the white heron or great egret (Casmerodius albus), while the photo just above (from here) shows the Chinese pond-heron (Ardeola bacchus). As well as the herons of the genus Ardea, this group also includes the egrets (Egretta) and the pond-herons in Ardeola and Butorides. As the common name indicates, the day herons are largely diurnal. The males of a number of day heron species (most notably members of the genus Egretta) produce long decorative plumes in the breeding season, as can be seen in the photo of Casmerodius. 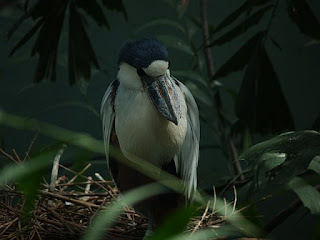 The night herons (Nycticoracini or Nycticoracinae) of the genera Nycticorax and Gorsachius are generally shorter, stouter birds than the day herons, with relatively shorter beaks, as well as (obviously) being nocturnal or crepuscular. Osteological data suggest that the night herons are closely related to the bitterns, while molecular data would place them closer to the day herons (McCracken & Sheldon, 1998). 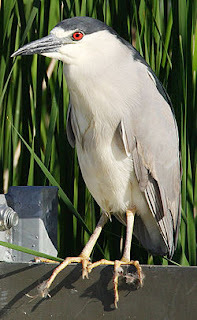 One night heron genus, the American Nyctanassa, is included by Kushlan & Hancock (2005) among the day herons as opposed to with the other Old World night herons. The boat-billed heron (Cochlearius cochlearius - shown above in an photo stolen from Brian Switek) and the agami heron (Agamia agami - photo below from Arthur Grosset) are both South American oddballs that have been particularly difficult to place among the herons. In the case of Cochlearius, it was regarded as distinct enough that Wetmore placed it in its own separate family. Cochlearius differs from other herons in its unique beak structure and the number of powder-down patches on the chest (four as opposed to three). However, Cracraft (1967) claimed that, except for features directly connected with the beak, Cochlearius was little different osteologically from Nycticorax, and in fact resembled Nycticorax more closely than the other night-heron genus Gorsachius did! While osteological data might indicate that Cochlearius is simply a very specialised night heron, DNA-DNA hybridisation data indicated a more basal position, around the level of the tiger-herons (though unresolved as to which of the two was the basalmost clade - McCracken & Sheldon, 1998). Whichever is the true position, it is clear that the boat-billed heron is highly specialised, though we have little idea what, in fact, it is specialised for - Biderman & Dickerman (1978) found little apparent difference in diet and foraging behaviour of boat-billed herons from more typical heron species, and were only able to suggest somewhat half-heartedly that the oversized beak might be related to courtship displays. The agami heron (Agamia agami) seems to be a specialist bank feeder (Payne & Risley, 1976). In proportions, it is much like a day heron, and osteological data also associates it with that group. However, if it is a day heron, it differs in a number of characteristics from the other members of that group. As can be seen in the photo above, it is a particularly colourful bird, and it is distinct from the day herons in many features of its adult and juvenile plumage. It also has a particularly slender, needle-like bill. The relationships of Agamia do not seem to have yet been investigated molecularly. Biderman, J. O., & R. W. Dickerman. 1978. Feeding behavior and food habits of the boat-billed heron (Cochlearius cochlearius). Biotropica 10 (1): 33-37. Chang Q., Zhang B.-W., Jin H., Zhu L.-F. & Zhou K.-Y. 2003. Phylogenetic relationships among 13 species of herons inferred from mitochondrial 12S rRNA gene sequences. Acta Zoologica Sinica 49 (2): 205-210. Cracraft, J. 1967. On the systematic position of the boat-billed heron. The Auk 84 (4): 529-533. Kushlan, J. A., & J. Hancock. 2005. Herons. Oxford University Press. McCracken, K. G., & F. H. Sheldon. 1998. 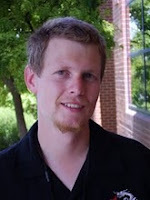 Molecular and osteological heron phylogenies: sources of incongruence. The Auk 115 (1): 127-141. Payne, R. B., & C. J. Risley. 1976. Systematics and evolutionary relationships among the herons (Ardeidae). Miscellaneous Publications, Museum of Zoology, University of Michigan 150: 1-115. "The males of a number of day heron species (most notably members of the genus Egretta) produce long decorative plumes in the breeding season,"
Interesting. Does this imply that the night herons are not "decorated", since they can't use visual displays to attract mates? Most day herons produce long, feathery plumes on the head and back, while night herons (including Nyctanassa) and Agamia produce sleeker plumes trailing down the neck on the back of the head - you can see the plumes in the Agamia photo. Thanks! 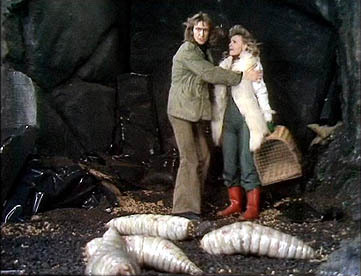 So my notion of visual selection determining mating togs was wrong. You never know unless you ask. Thanks for answering silly questions. Is the anhinga related to this group? Well, both are part of the "higher waterbird" clade that a number of analyses have identified, but beyond that, not particularly. Anhingas belong to the Suloidea, which also includes the cormorants and gannets, with most researchers placing them closer to the former. The relationships of the herons are a bit more difficult. Relationships within the higher water-birds as a whole are very uncertain - the clade contains members of what were the Ciconiiformes, Pelecaniformes, Procellariiformes, Gaviidae and Spheniscidae, but the first two orders seem unlikely to form monophyletic clades within the group. Ericson et al. (2006) had the herons sister to the Threskiornithidae (ibises and spoonbills), while Livezey & Zusi (2007) found herons sister to a clade containing most of the remaining 'Ciconiiformes'. I should note, too, that the Livezey and Zusi tree has Cochlearius strongly positioned as basal to the remaining herons, with the day herons weakly connected to the night herons, and the tiger herons weakly united with the bitterns.